Do you like pie, pie, pie? How about classes, classes, classes? 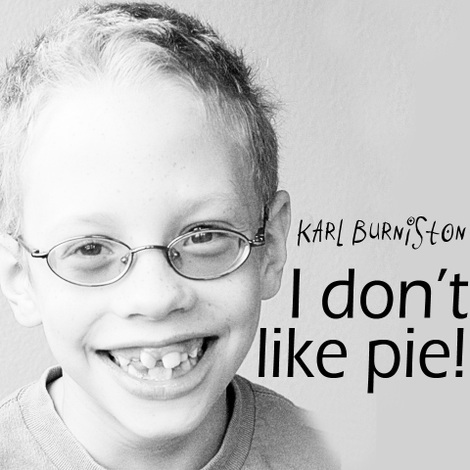 ME: Karl, I love your "I don't like pie" song, but since when do you not like pie? KARL: I don't like it. I've tried it. ME: Well what about pumpkin pie? KARL: Oh. (pauses to consider) Well, I didn't count that because we only have it on Thanksgiving. ME: Ah. That makes sense. Well what about apple pie? KARL: Well . . . I guess I do like apple pie, but only if it doesn't have too many apples in it. ME: Naturally. That goes without saying. So what do you think, then? Do you like pie? Eesh. I give up. Let him think he dislikes pie. It will save me some baking. Actually, I really don't bake much. 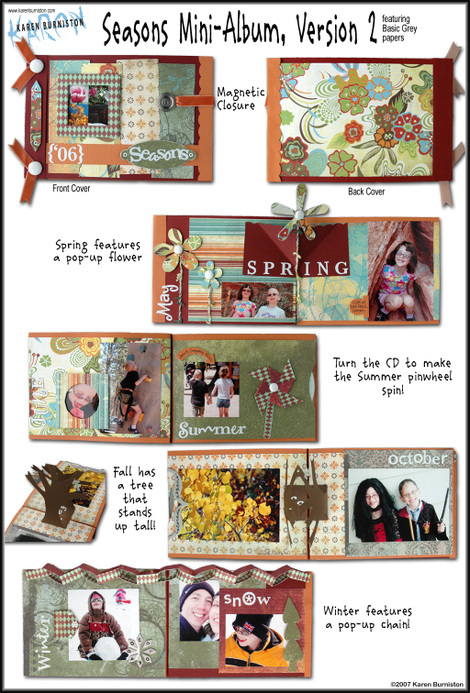 On Saturday, October 20th, from 1-4 pm, I will be teaching an updated version of the Seasons Mini-Album at Scrapbook Destination in Centennial, Colorado. It's the exact same project as before, but instead of the Basic Grey Blush line, we'll be using papers from Mellow, Periphery and Recess. I will be teaching the original Seasons Album (also known as Weather Comes to Mind) in Belgium at Hobby Select on Sunday, November 11th. I will teach two brand-new classes (still in production) at Akke Fietje in Eindhoven, Netherlands on Thursday, November 15th and then two more brand-new classes (still in production) for Scrap-a-Ganza November 16-18th. This re-design of the Seasons Class is an excellent illustration of what I really try to convey with all my class projects - MAKE THEM AGAIN and MAKE THEM YOUR OWN! Please! Choose different colors, different themes, and use the techniques over and over again. That's what the handout and templates are for! I have this theory (mantra really) that if I teach enough techniques in my classes, then the students can forgive all of my design shortcomings. They can hate my colors, hate my pairings, hate my style, but they only have to make it my way once. After that they can redo the project in their own personal style. In that respect, I hope to provide value to every single student, regardless of their unique tastes. Because, let's face it, when you're teaching a class to hundreds of people, you simply can't hit a homerun with every student, style-wise. How cool is that?! It is the exact same Inner Circle design using a completely different collection and giving off a completely different vibe. While the original project, done in Guenivere, has a serene and sophisticated feel, Lance's version is young, hip and edgy. I love it! Oh hey! And Lance is blogging now, too! Here's a link: Where in the World is Lance? And now I'd better get off this computer and get back to work on those new classes! Oh there is fun stuff on the horizon! What did pie ever do to you? In one of those bizarro moments of my life (and there are plenty), I heard Karl's voice coming from the basement this morning after I had watched him get on the bus and watched the bus drive away. He sounded very happy - I could hear singing - and I wondered how on earth he climbed out of a bus window when we all know that those windows are impossible to open! What I discovered was Emma listening to a recording Karl had made on the computer last month while John and I were in Georgia and their grandmother was staying with them. Apparently he had 5 minutes and 44 seconds before they were leaving for the movies and he decided to compose and sing an original song on the computer during that entire time! And apparently he doesn't like pie. I will have to remember this next Thanksgiving. I have foolishly believed his ability to devour a piece of pumpkin pie in three bites, asking for seconds while the last piece is still grossly viewable in his pie-hole (see what I did there?) to be an indication that he finds it, well, tasty! Silly me. I shortened the tune by taking out several (but not all) repetitive stanzas of "I don't like pie", but I'm afraid even the shortened version still clocks in at 4:55. You have to be a pretty die-hard Karl fan to make it to the end, but it's got a fabulous ending, so hang in there! Geoff writes: Dude, that was brutal. Maybe it isn't pie he doesn't like but pi as in 3.14159... Does he have something against circles? Lloyd writes: Hey... What are you teaching this kid... Next it will be a song about not liking chocolate! Luke writes: Someone get this kid a WORKING video camera and a YouTube membership! "I'll take a little bit of God for some free jelly beans!" And that's why I love Evelyn. We went to a rubber stamp show on Sunday. Sandy and I had just returned from Chicago that morning. The Scrapbook Expo in Chicago (St. Charles) was quite an experience - we got evacuated from the building on set-up day due to . . . a tornado watch! I needed a stapler, see. And so, earlier, before the tornado scare, I went to the front of the expo hall looking for Dave or Sandra or someone who works with SBE to see about borrowing a stapler. Only nobody was around. But I saw a stapler on the desk. I didn't leave a note. I didn't figure anyone would miss it, actually. And it's not like I was going to keep the stapler. I was just borrowing the stapler. Nobody was using the stapler. It was just, you know, desk filler. "ALL VENDORS MUST IMMEDIATELY EXIT TO THE BALLROOM! WE NEED EVERYONE IN THE BALLROOM!" And I totally thought that they had discovered the missing stapler and planned to hold some sort of grand jury inquisition to flush out the thief. DAVE: Someone has stolen a stapler! VENDORS: GASP!! Who did it? How did it happen? DAVE: The staples were left alone and the thief followed those footprints toward Dollar Scrapbooking! VENDORS: Shall we track them both? DAVE: The staples are nothing. Only the stapler matters. Clearly this was all planned by workers at Dollar Scrapbooking. We must all be ready for whatever lies ahead. VENDORS: Could this be a trap? DAVE: I always think everything could be a trap. That is why I'm still alive! After that I figured I'd be called up to the front of the ballroom. DAVE: 'Allo. My name is Dave from Scrapbook Expo. You stole my stapler. Prepare to die! But thankfully none of that happened and it was just a tornado. Whew! I had some really fabulous helpers at the booth. Thanks to Margi, Cathy, Tracy, Traci, Claudeen, Nicole, Renee, Christine, Mary, Linda and, of course, Sandy. Couldn't have survived without you! So we get home and turn around and head to the stamp show. It was Evelyn, Sandy, Donna and me. As I strolled through the final booth, the one where I would fall in love, I noticed Evelyn and Sandy munching on some jelly beans. ME: Hey! Where'd those come from? EVELYN: That booth right there has free bags of jelly beans! I saw Sandy studying the little card that was attached to the jelly beans. She walked over and held it in front of Evelyn, as if to say "HERE is the reason they'll give us candy - so we'll read their scripture!" Ev just shrugged and said "I'll take a little bit of God for some free jelly beans." I almost choked on my pilfered bean! I dug in my purse to find something to write with. I'm fighting the clock here, so I'm going to save some info on upcoming teaching appearances until my next post. Those of you who live near me - I'm having a scrapbooking garage sale on Saturday with a bunch of dirt cheap supplies, like grab bags of paper, 100 sheets in each (including a couple transparencies and gold embossed sheets per grab bag) for $5. Embellishments and rub-ons for a dollar. Sticker sheets for a quarter. Letter sticker sheets for fifty cents - you get the idea. CHEAP! Why do I need groceries when I can just eat my foot? We've survived half of the birthday weekend. Emma's party was today at the skating rink and a good time was had by all. After rounding up the gang for cake I asked how many of them had fallen down on the skating floor and all 9 hands went cheerily up. They started relating their best wipe-outs to the complete fascination of the others. And I love SNL references. A cat wandered into our house today. That's not a SNL reference. A cat really DID wander into our house today. But enough about all that. The central question remains . . . why do I need groceries when I can just eat my foot? Wait - then I'd only have one foot. Jealous?! Because despite the fact that I had ZERO energy, we also had ZERO food for dinner so I had to go to the grocery store. And what happens when you go to the grocery store at 6 pm on a Saturday night is you find it luxuriously empty. Like you don't have to wait at the deli behind some lady who wants a half a pound of everything. And you don't have to wait to check out. So I was particularly giddy, what with my no-wait roast beef, as I cruised right up to an open check-out line. And I got even more giddy when I remembered that this particular checkout lady was deaf. I gave her a big wave and didn't try to talk to her like I usually do, at which point she completely ignores me because she's looking down at the cart and can't, you know, hear me. There wasn't a large bagging staff on duty, what with the store being relatively empty, so I stepped to the end to start bagging, knowing that it was going to be a short-lived funfest because if there's one way to attract a bagger, it's to start bagging your own groceries. Even if you LIKE bagging your own groceries, which I do. Because it's kind of fun, don't you think? All those groceries spilling off the conveyor with only seconds to decide how you're going to group them. Seeing that small space in the bag you're working on and diving for the parmesan cheese that will just fill it. Bagging things together in logical order, rather than the fruit in with the meat. I could go on and on. Only I couldn't go on and on because the bagger came over and relieved me after I'd packed one measly bag. I said, rather sadly, "I guess you're here to take over, huh?" and, naturally, he said "Yes, ma'am"
But my spirits would not be dampened. I was on a no-wait-for-roast-beef-or-check-out-remember-the-deafness high that could not be dampened so easily. I pointed out the one bag that had three perfectly balanced boxes of cereal in it and said "I did a good job on that bag, huh?" And he laughed and said "Yes, you did." And this should have been the end of the conversation. Only sometimes a high can be intoxicating and cause you to blurt out something that seems perfectly amusing in your head, but doesn't seem nearly as funny once you've uttered it. Because I said "Yeah, and I have no training, either!" This sounded completely funny in my head, mind you. Once out there, though, I realized that I had just called his job menial and suggested that (A) an untrained driving monkey can bag groceries as well as the professionals, and (B) there's nothing professional about being a bagger. He said, rather coldly, "Well there really isn't much training involved," as I melted into a blushing pile of goo. I couldn't even talk to the checkout lady to ease the silence because (A) I don't know sign language, and (B) she has to concentrate on the screen to make sure everything scans because she can't hear the beeps. One time she checked me out and something expensive didn't scan. I happened to be paying attention, I think because I was curious how expensive that expensive thing was, and noticed that it didn't register when she scanned it. No beep. No expensive price added to the total. So what I did was to grab that item off the conveyor and hand it back to her, telling her via charades and hand gestures that it didn't scan. She thanked me in sign language and scanned it. And I pretty much thought I was a saint. I sat there throughout the rest of the transaction congratulating myself on my honesty. I imagined the checkout lady going home and signing to her husband about the kindness and upstandingness of one of her customers. Yes, yes I did. The honesty was not its own reward - I wanted a medal. But today I was just rather glad that she was deaf and didn't hear the stupid thing I said to the bagger. I'll sign off with a comparison photo. 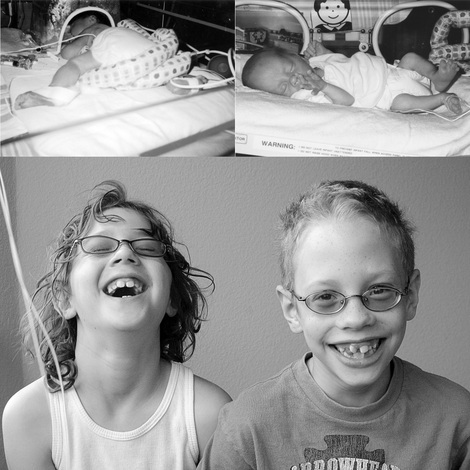 Amazing what 9 years can do to a couple of preemies, huh? The kits will include the album (which comes with 20 page protectors) and the supplies to decorate it. If you sign up to decorate one at the show you get a price break because there are more shared materials. Paint and tools will be provided at the table. If you purchase a "to-go" kit, you'll get more full packages and leftover materials, but you must supply your own paint and tools. Instructions and a color photo are in the "to-go" kits. Still looking for workers for the SB Expo in Chicago (St. Charles) August 23-25th. Post a comment or e-mail me for more info. I am happy to report that T&C is back in the garage, mended and looking quite lovely, and is receiving extra TLC after her ordeal. (For those of you confused, just read Tuesday's post) In fact, if you're here for the opportunity to laugh hysterically at my misfortune, you'll want to scroll down to Tuesday's post. This one is pretty much all business. 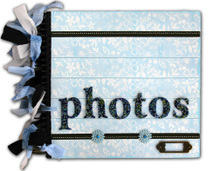 I do a lot of work with Dollar Scrapbooking and I have some upcoming shows that I need to recruit workers for. If you would like to work any of these shows with me, I need help on Thursday for set-up, Friday and Saturday during the show hours to run the booth, and for 2-3 hours after the show closes on Saturday to break down the booth. The pay is $10 an hour in cash, or $20-worth of product per hour. You can mix and match the pay as you see fit. Parking and lunch are provided for all-day workers. If you leave a comment here or follow the link to e-mail me, I'll send you more information about the shifts available. 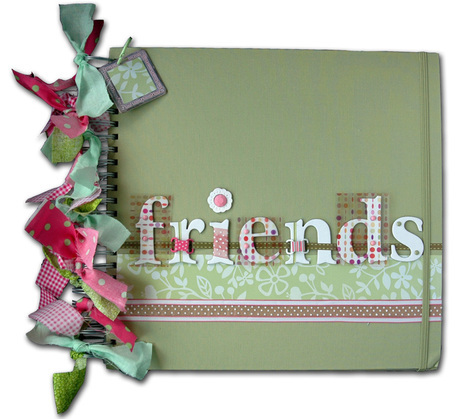 Also, I will not be there myself, but Dollar Scrapbooking will have a booth at the Scrapbook Expo - San Jose (Santa Clara) August 10-11. Kristi (the owner) was on the waiting list for that show and wasn't able to get enough booth space to offer the typical dollar store booth that we set up at every other show. Instead, she will have a small booth that will sell only pre-packaged kits. The product kits will be themed and will include a variety of coordinating materials for rock-bottom prices. DSB is able to offer so many fabulous items for a dollar because Kristi buys discontinued and overstock merchandise in bulk quantities. Occasionally she also gets deals on higher-priced items that she can't offer for a dollar, but she can sell for a fraction of the original retail price. One of those current special values is a large shipment of Heidi Swapp albums in 9x9 and 12x12 size. What Kristi will offer at the San Jose show only, is a pay Make n Take to create a decorated album in one of 6 different themes. So that you aren't waiting in line, you simply stop by the booth, sign up for a half-hour time slot, and return to the booth 5-10 minutes before that time to claim your spot. 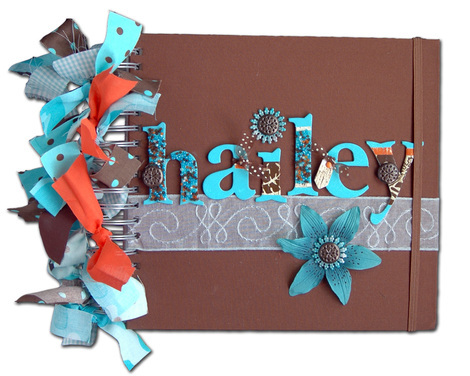 She'll have all the tools and supplies you need to decorate your album. A lot of the supplies will be table supplies, meaning shared, but you will have some leftover product to take home. Another option, for people pressed for time, is to buy the "to-go" album kit, which includes step-by-step instructions and all of the supplies except paint. The price is higher for the "to-go" kits because we can't share supplies and so we have to include a lot of complete packages in the "to-go" kits. Either way, though, at the table or in the "to-go" kit, these decorated albums are a great deal, and are priced well below the retail value of the supplies. I chose colors that can be used for a boy or girl name. If you think the flower is too girly for a boy album you can eliminate it and use the layered middle embellishment without the petals. It's California, and so I thought it fitting to offer this album design. There will be a template to paint the Mickey head on the album. Oh, and each album comes with 20 page protectors - space for 40 layouts! The Travel album can be made with the window album (shown above) or with the windowless spiral album and Kristi will have both types at the booth. On all of the albums the chipboard letters start white and then get blinged up with paint, tape, beads, brads, etc. You can choose to follow my design exactly or do something a little different with your supplies. 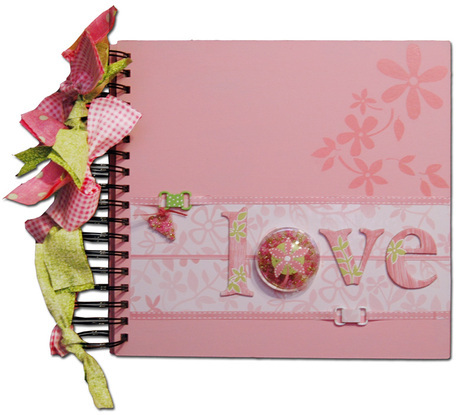 The Love album is a "to-go" kit only because the album is plain chipboard and must be taken apart, painted pink, and then re-assembled. (Too time-consuming for a half-hour slot) The "O" is actually recycled packaging from one of the embellishments turned into a bead shaker. This is our first time trying a booth concept like this, so I hope it will be successful. I'm sure if any kits remain at the end of the show Kristi will offer them on her website or sell them at future shows until they're gone. 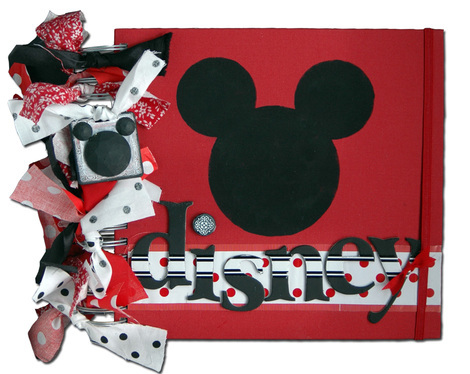 So if you can't come to San Jose but you desperately want a kit, I would suggest following the link to Dollar Scrapbooking and clicking on the "Contact Us" button for Kristi's e-mail. She can put you on a waiting list for the leftover kits. Make sure you tell her which one you're interested in. She did not finalize the pricing on these kits before leaving for a show this weekend, so I'll update this post with prices when I find out. And now I move on to the arduous task of planning two birthday parties. Karl and Emma will be 9 next week. Hard to imagine!